Former Greece midfielder Stelios Giannakopoulos says he fears that continued violence at games threatens the future of the sport in his country. 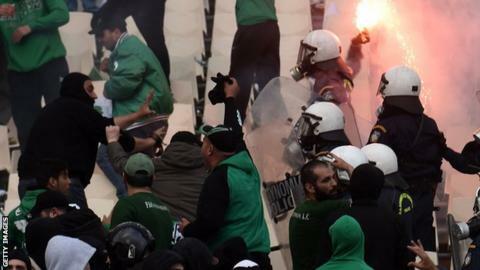 The Greek government has suspended professional football three times this season because of violence at matches. The national side are bottom of their Euro 2016 qualifying group and sacked manager Claudio Ranieri in November. "Football people like myself, we are little bit concerned about football in Greece in the future," said Stelios. Speaking to Sportsworld on the BBC World Service, the former Bolton and Olympiakos player added: "We need support from Uefa, from [world players' union] FIFPro and of course we need support from the Greek government, which is completely new. "All these [should] sit down together at the same table and take some decisions." Greece, without a win in Group F, host Hungary on Sunday with just one point from their five qualifying matches. Former Chelsea manager Ranieri was dismissed after defeat by the Faroe Islands. Greece reached the last 16 of the 2014 World Cup in Brazil, losing to Costa Rica on penalties. Stelios, who was a member of Greece's Euro 2004 championship winning side, says he has offered his services to the Greece Football Federation. "I cannot figure out how quickly we've gone from the last 16 of the World Cup to be bottom of the table," he said. "If we lose on Sunday I think that's it. It's a must win game for us."